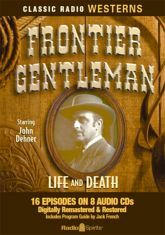 John Dehner is back as London Times correspondent J.B. Kendall. He is an outside observer of outlaws, a chronicler of cowboys, but as a British Army veteran and a man with a gun, "he lives and becomes a part of the violent years in the new territories." Kendall bears witness to trouble with Western women and intervenes with impulsive men (Indians and Irishmen, cattlemen and holdup men alike). On the frontier, he discovers that sometimes justice is just out of reach�and, sometimes gambling means having to bet on more than just his hand. Saddle up for 16 digitally remastered and restored episodes presenting performances by Harry Bartell, Ted de Corsia, Virginia Gregg, Stacy Harris, Joseph Kearns, Jeanette Nolan, Ben Wright, and featuring Jeanne Bates Lansworth as Belle Siddons. Program Guide by Jack French with photographs and information about this wild Western adventure drama.